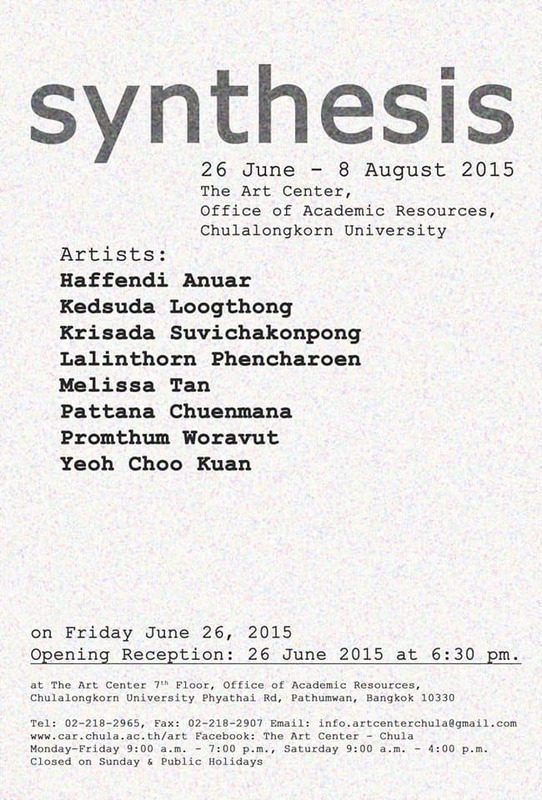 Synthesis is an act of combining separate things to create something new or more complex. This act is basic to contemporary art, considering how existing conditions and factors from both the inner and outer worlds, from the individual to social levels, affect the creation and essence of contemporary art today. Frequently, artists synthesize data and what they gather around themselves, turning them into content or stories that they tell in their own ways. This also rings true for the eight artists in this group exhibition, although each has his or her own unique method of synthesis and perspective. Despite their different ways of looking at and corresponding to what they try to synthesize, the works reflect the artists’ individuality, surrounding conditions and ways of thinking, which constitute their unique personalities and outlook on contemporary life. พิธีเปิดนิทรรศการ: วันศุกร์ที่ 26 มิถุนายน 2558 เวลา 18.30-20.30 น.